Photo via Ben Heaney over at http://www.digitalviolin.com. This was originally a guest-blog written several years ago at the request of my dear friend Warren Ellis, for Die Puny Humans (may it rest in peace). Now with visual aids! The phono-fiddle is much louder than a conventional violin, but its timbre is thinner, with eerie phonographic overtones. Vibrations from the strings are conducted to the center of an aluminum disc that acts as a diaphragm (like a very old-fashioned amp), propelling the sound back out through the large horn and smaller ear trumpet. 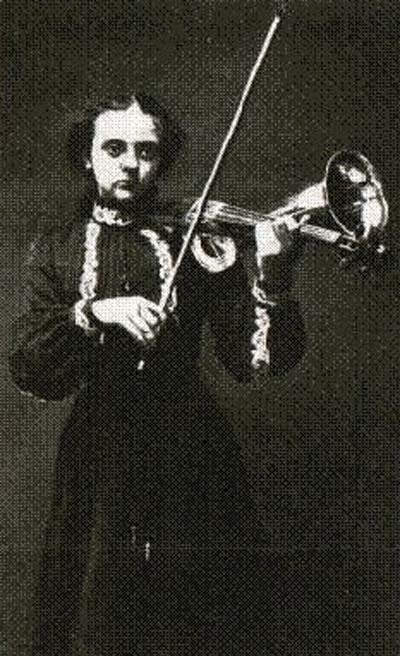 John Matthias Augustus Stroh invented it in 1899 because regular violins were too quiet to register on the wax cylinder recorders of that era. Before the advent of electric amplification, recording devices relied on sound vibrations being funneled through a large metal cone that moved a sharp cutting device, which in turn gouged grooves into a rotating tube of hardened wax. When played back with a stylus, these grooves in the wax were interpreted into sound. Anything one records in this fashion –even modern techno– will sound as if it’s had to sluice its way through a sea of decades. When music finally reaches the listener, awash with hisses, pops and clicks, it has become the ghost of a song. Never fails to raise all the tiny little hairs on the backs of my arms. As early as 1910, Thomas Edison’s company was the only major company still using wax cylinders. Disk record technology had advanced in leaps and bounds and was far less expensive. Thus, the wax cylinder recorder and the Stroh fell to the wayside, lost on that shiny, steampunk junkpile reserved for all esoteric sciences. Augustus is definitely not without his faults: there’s a big dent in his bell, the ear trumpet is wonky, the bridge needs work and his pegs are slippy. When I walk down the street with him, people point and stare and make rude exclamations. I could care less. He’s gorgeous. An old soul. There’s nobody quite like him anywhere on earth. We are so very lucky to have found each other. I love the stroh violin. Carla Kihlstedt of Sleepytime Gorilla Museum (my favorite band) sometimes uses a Stroh violin. One of the times they played here in Atlanta the band marched from the back of the venue with Carla playing the Stroh violin and the rest of the band playing more traditional brass instruments. They slowly meandered their way through the audience and up to the stage while playing. It was a great start to a great show. 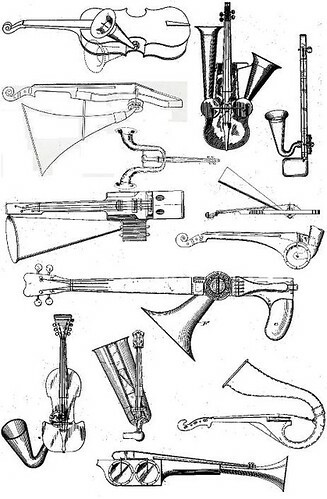 I’m pretty sure Carla actually uses one of those Romanian trumpet violins. Similar functionality, but the design is a bit different. No ear trumpet, a longer, narrower horn, and they’re less clunky… lighter and easier to play. But yeah… Adam Feinstein, the same brilliant fellow who directed the Corpses video is going to collaborate with them on a short film based all of that “Save The Last Human Being” musical and theatrical material, including the procession you’re talking about. So exciting!! Wow, a Last Human Being short film, you have just made my day! I have seen them four times and while I would be hard pressed to name which time was the ‘best’ the last human being show was certainly the most wonderfully theatrical. Momo is amazing and the addition of his butoh dancing to their music was perfect. You and Augustus make the cutest couple on earth! Other instruments must be jealous. 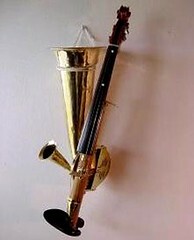 I too can only think of Sleepytime when I see such an instrument. Ben… Shinichi Momo is awe-inspiring. I’m hoping Lara Miranda, who shot and edited a brilliant “making of” documentary about Corpses, will post it online soon. There’s some amazing footage of Shin just goofing off. At some point I would like to find out what stroh cellos and stroh basses sound like. Google tells me they exist…but alas I haven’t found any recordings. Yes, I’d love to hear one as well. Lemme know if you ever track any recordings down. My first exposure to one happened in 2000 at the Thomas Edison Historic Site. A band I used to play in, Piñataland, was hired to give a wax cylinder recording demonstration during the Edison Festival. Man, it was mind-blowing. Now, if only someone would hook me up with a Tesla Coil theremin..?? Yesterday in Berkeley, Kronos Quartet performed Terry Riley’s Transylvanian Horn Courtship on a complete set of Stroh instruments. So, keep an ear cocked for a recording or performance of that. I’ve described it as sounding somewhere between Arab-African fiddle music and a ’20s megaphone (but I think I’ll steal your Victrola comparison).